I can't believe it. 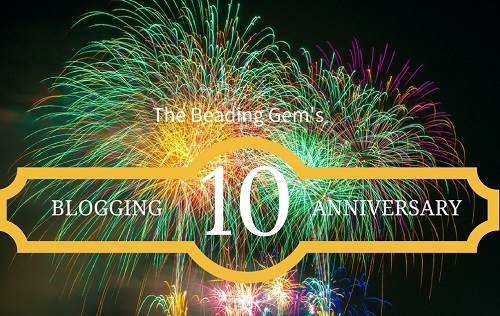 But here I am marking my 10th blogging anniversary! On that distant day, January 4, 2007, I embarked on this journey with a simple aim. I needed a website as my then students asked if I had one. I thought a blog rather than a static website was a great way of sharing their creations online. Little did I know then that it would grow to what it is today - a place to share creative ideas and inspirations for this wonderful craft. A lot of effort goes into this blog - much of which is behind the scenes. Not counting my cats who often keep me company, there is just me. No other staff members! I wear many hats - jewelry designer, writer, editor (not always on the ball with editing), publisher, webmaster, social media person and so on. But my blog would not be possible without all your encouragement and tips through emails, comments and subscriptions, the contributions of thousands of generous jewelry artisans and the support of wonderful sponsors. So a big thank you! I do incur various expenses in keeping all of it going. The ads and small affiliate fees I receive when any of you choose to shop through my blog go a long way in supporting this blog. Another big round of thanks. There are, to date, 4220 published posts - more than one a day over the past decade! So policing the blog for bad or outdated links is a never ending and growing task. I thank the many readers who take the time to let me know when something needs correcting or updating. This helps everyone as people still search and refer to older posts. I am delighted to learn many of you read my blog as you enjoy your morning cup of coffee. Did you know you have an option of subscribing via email (daily or weekly) so you don't miss a post? Following my blog on Bloglovin' is another alternative if your inbox is threatening to explode! It has a lovely Pinterest-like format and you can save posts from all your favorite blogs there too. They have great mobile apps. I share all my blog posts on Facebook,Twitter and Google + which is convenient for those of you who hang out there. I also share other things on Facebook and Twitter - interesting ideas or fun items which do not make the cut on my blog. I am an avid pinner - I share a lot on my Pinterest, not just jewelry related pins. Go ahead and be nosy and see what I pin!! Some of you have wondered how I manage to write this blog. While I do not recommend you attempt a daily blog, some sort of regularity is necessary. The only way to cope is to schedule your posts ahead of time as I do. Writing, like making jewelry and other skills, takes practice and with time, writing becomes easier and you will develop your own style or "blog voice". So hang in there! Last but not least, I wish all of you a Happy New Year! Go forth and be creative. But remember, just like blogging one post at a time, learning new skills, reaching your creative goals, opening your online store, all these things are best achieved bit by bit. This adorable little girl says it right about all the New Year resolutions we make! Congratulations, Pearl, I can't believe it's been 10 years! Still love your blog as much as I did in the beginning. You're very talented, lady, in many directions. Congratulations! I look forward to many more years of following your blog, Pearl! Congratulations, Pearl. I think I've been following you most of the 10 years. Doesn't seem possible. I tried everyday and didn't make it but I do once a week and find it very helpful for my business. Gives me a small goal to think of something new to write about. You are probably one of my longest running readers, Bev! Once a week is reasonable for most people! Thanks very much! Congratulations ! And thank you for all you show us ! Thanks Karla! It remains to be seen if I can make it to the second decade! Congratulations, Pearl! Love your blog. I tend to follow it from link to link to Link! Thanks for all you do for us. LOL! So glad that you get to explore my blog that way! Thanks everyone for your kind wishes!! Congratulations Pearl! I know how hard you work and your success is well deserved. And OMG that video is so cute! You wonder what appeals to us? Well - first off - you know I don't do beading but I know you've told me that beading posts get the most notice. I haven't a clue about right angle weave or any of it..for me it's like - put your right foot in and put your right foot out - put your right foot in and shake it all about.... Still - I do leave a comment because what you show us is always something that is pretty and jewelry which counts. For me it's metal work and polymer clay. Then it's anything new or fascinating work that I've never heard of. Those are my absolute favourites! Like - The Secret Wood Ring and how it's probably made....loved that!! Over the years I've been reading your blog I've learned an amazing amount of things and I've even implemented some of them into what I do. And - after all these years of reading and commenting and even sending in artists and tutorials I've found - it's our friendship that caps it all off!! Thank you so much for giving all that you do. I know without a doubt that it comes from your heart. You are the epitome of generous my friend!! Congratulations and here's to another 10 years at least!! Thanks! Here is hoping I make it for another few years - not sure about 10 years! Maybe blogs will cease to exist by then? Happy blogiversary, Pearl! I don't comment much, but I'll take this occasion to let you know I don't miss a single post of yours ever since I discovered your blog. :) Thank you for all the invaluable information you provide -- I appreciate the hard work that goes towards it! What an achievement! Your dedication to your blog and your readers is evident in the quality of the posts you bring to us. You find so many interesting techniques that we could never hope to find on our own - thank you. As a fellow blogger, I know how hard it is to maintain a blog, and the fact that you share such quality content every day is an achievement in itself. But to do it for 10 years is astounding. Thank you, Pearl. I look forward to your email arriving in my inbox each day! Long live the Beading Gem! Happy Blogiversary, Pearl. Thanks Mylene for your warm wishes. It does take a fellow blogger to fully realize the work which goes into it!